This article will discuss useful concepts and the general ideas behind using async / await in C# 5. We will investigate why this is useful and what the two keywords do excactly. Our journey will start identifying various lanes of program execution, called threads, and what the abstract concept of a task is. The initial question we have to ask, before going into the discussion is why we care about having multiple threads anyway. Moore's law states that the number of transistors on integrated circuits doubles approximately every two years. For decades this came along with increasing the number of operations per second of a single core. However, this was only possible, because the frequency also followed an exponential growth. Due to Dennard's law it was not possible to keep both values, frequency and density (transistor count), at an exponential growth. Therefore the frequency growing is now over and the only way to get more operations per second is to involve more cores in the computation, as well as improving the chip architecture. In most applications we will not be computation bound (CPU-bound), i.e. we will not come close to the limits of the CPU. However, even 10 years ago, we have been memory bound (IO-bound) in most of our applications. Formerly this has been true for local IO, like memory or disk access. Nowadays more and more traffic is network IO, like downloading data from the Internet or some other computer in a network. While computation bound applications will certainly take the most benefit from multi-core CPUs, other applications can also benefit from having more cores. Since the late 1980s every standard operating system (OS) allows us to use more than one application (even though there has been just one core). The OS does that by giving each application some time on the CPU. Once the time quota that has been given to one application is exceeded, the operating system will perform a context switch to some other application. Modern operating systems make use of multi-core CPUs by reducing necessary context switches and (additionally to the time management) CPU allocation management. Usually the time management of modern operating systems is based on so called threads or processes. In Windows we have a thread based time management. This results in the paradigm that we should transfer CPU heavy computations to some different thread (different from the one running the GUI), such that the GUI can still do some other things. This made sense for 1 core (the OS will give the GUI thread some time and it will give the computation thread even more time), and makes even more sense for 2 cores (now it is possible that the computation thread is actually working fulltime until the job is done, while the GUI thread gets a little bit of time on the OS core). In Linux every thread is a process (simplified model as there are a few differences). Now for memory bound methods it makes sense to use another thread in case of non-available asynchronous operations - just to keep the GUI active and responsive. If an asynchronous operation for doing the memory operation exists, this is certainly the preferred way. The argument is the same as for the computation bound method; the OS will schedule some time for the GUI thread as well as for the (waiting) worker thread. The argument for getting some benefit from using another core is also quite similar: In this case we might not need to perform context switches, giving us better performance and less wait time (however, the difference is only measureable in µs (10^-6 s)). Therefore using threads is one way to tell the operating system which units of compution belong together. According to this the operating system will schedule computation time, CPU allocation and more. Dividing our applications into multiple threads will therefore guarantee better CPU usage, program flow and responsiveness. Using asynchronous operations when possible will give us benefits for having a responsive UI while not requiring the time to manage threads. Looking at our program from the perspective of such threads will result in two different kind of variables. Those which are only in the scope of the thread, called thread-local (or sometimes thread-static) variables and those which are available to all threads. Such variables are called global variables. Of course we still have the local variables, but since the function's scope is always created by the thread invoking it, those variables belong also to the specific thread, as the thread-static ones do. Already from the names we can assume that thread-local variables will not provide any problems. One thread uses its local variables until the thread is terminated. Only the thread itself can read and write the values of such variables, which is why there is no problem. However, in the case of global variables we are introduced to a new kind of problem. Depending on the structure of our application we might have the case where two or more threads access one variable. In case of reading the variable there is no problem, but once the value of the variable gets modified the problems start. The first problem is obvious: What if multiple threads can write the value? Well, in such cases the last thread writing on the variable wins. This might not seem like a big problem at first, but it can result in unexpected behavior if the thread(s) that write the value want to use the value afterwards. In such cases the value might change and a different value is used afterwards, coming from some other thread. The second problem is of course related to the first one. What if only one threads wants to write the value, with the other threads reading it? Even here we might have a problem, since we can not guarantee that the write happens before the reads or that the reads happen before the write. Those two problems lead to the term Race Condition, i.e. a state that is given when two threads do actually race for accessing a resource. Usually race conditions appear not very often (from the perspective of a computer) and unpredictable, however, given that most operations are executed in loops or regularly, it is very likely to see a race condition appearing in some codes quite often (from the perspective of the programmer). As an example: If a race condition appears once in a billion instructions (which not very often for a computer), we will see it every second (which is very often for us). The solution to avoid race conditions is usually given by atomic operations. An operation is atomic if it appears to the rest of the system to occur instantaneously, i.e. if they either successfully change the state of the system, or have no apparent effect and if they can only be executed from one thread at a time. One way to force atomicity is by mutual exclusion, i.e. immutable objects. On a hardware level this has been done by a cache coherency protocol like MESI, or on the software level using semaphores or locks. If we want to draw a sample picture for this, with some arbitray sample data, then we could do it with the following diagram (we have 2 threads, marked red and blue). Now this is a really simple code. We compute the value of count by incrementing it in each iteration. So in the end, the value of count should be equal to max, which is the number of iterations. In any serial code (or for-loop), this is no a problem, however, once a certain number of operations is reached, we will definitely get race conditions. Why is there a certain offset of operations before we get some race conditions? The answer is that spawning a thread (even though the TPL is just activiting a thread that is already spawned on the optimized thread-pool) takes some time. Usually the thread has to change its state from idle or sleeping and requires the function to invoke. This function (with everything that is seen by the function, like local and global variables) requires a context switch to be performed. So this is a way to approximate the time for some thread to wake up. Here we see that 10000 operations are enough to get some race condition, while 1000 operations seem to be too few. Therefore we can state that the creation of a new task will take at least 1000 cycles (probably the real number is more like 5000 cycles, due to one iteration taking longer than 1 cycle). What is the easiest way to get over this burden? Well, on a software level we already stated locks as one solution. Lucky for us that the C# team knew about this and included locks in the language. All we need is to give the lock an address, which will then be used to determine if the lock applies for the given block of statements and to wait if it is currently in use. Having a language that supports locks syntactically is a great productivity boost! Now this is working without any race condition, however, looking at the execution time, we might see that this is usually at least N times slower than the original version. Here N is the number of cores used. On my UltraBook with 4 cores I had 7804 ms compared to 1548 ms for doing the example provided in the given source code. The additional time is coming from thread creation and thread synchronization (the lock itself also costs some cycles, usually in the order of 1000 to 10000 cycles). Also note: depending on the current state of technologies like frequency scaling, Turbo Boost and more (additionally to the workload of the operating system) one might not see the difference of N times at random invocations. If the method is the only thing that is executed by the thread, then this is a classic serial code, just with more overhead and therefore reduced performance. Not a good idea! If the method is only one method that is called from a thread running in parallel, then the following code is much more convinient. 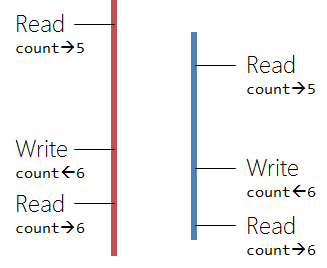 Running them synchronized represents the following diagram, which is basically the sequential (single-threaded) version. Generally this is a much faster and better way. It is also a nice way to keep certain operations atomic. On my machine the duration of the test method was 4478 ms - or about 33% faster than using lock. The best option for our example is to use thread-local variables. Such variables make a counter for each thread, which then can be used to perform one reduction in the end. So we reduced lots of global operations to just one, which is invoked as the last step. Luckily for us the creators of the TPL knew about this problem and gave us an overload of the Parallel.For method, which creates and uses such a thread-local variable. Looking at the picture above we see that both threads are doing independent work. Their (independent) results will then be used by one thread. It is worth noting that high performance libraries will perform this global operation (sum reduction in form of a gather) in a more sophisticated way. In networks (inter CPU) the topology of the network will be used, otherwise (if no topology is known, or we have the intra CPU case) a binary tree will give us a much better performance (the scaling using a binary tree is log2N instead of plain sequential gathering, which scales like N). On my machine the sample code runs in 461 ms, which is faster than the initial parallel code with the race condition problem. The reason for the speedup is the usage of a thread-local variable, which can be taken directly from the cores cache, instead of transferring it from some other core's cache or requiring the cache to be evicted. So we did not only get rid of the race condition, but also improved the performance. Some languages (but not C#, since you can not overload the = operator) offer atomic objects. In C++ you can create objects like atomic<int> (or use ones provided by frameworks like the Intel Thread Building Blocks). Such objects will essentially do the same. They will be thread-local and perform global operations, once the total value is requested (in most implementions the request has to be done explicitly, in order to avoid overhead). Those instructions have locked counterparts in the X86 instruction set, i.e. they have the LOCK instruction prefix. So we could not use the Interlocked class for adding two doubles, but we can certainly use it in this scenario. Another way to avoid race conditions in more complex objects, like arrays, dictionaries and lists is to use the so called concurrent objects of the .NET-Framework. All those objects can be found in the namespace System.Collections.Concurrent. Here we have classes like ConcurrentDictionary or ConcurrentStack and more. All those objects provide a concurrent access to the members of the more elementary object, like the List<T> in case of the ConcurrentList<T>, however, they do not provide a thread-safe access to the underlying elements. A complete discussion of those objects will not be done in this article. We already learned that computationally-bound tasks should be used with the TPL. Here using more cores makes sense, since it will speed up the computation. It also makes sense to use the TPL in a different thread, since then we will also keep our GUI responsive. For memory-bound tasks only the latter makes sense, i.e. 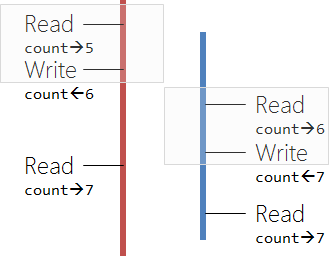 we should not use the TPL, since using more cores / threads on a memory bound task only results in overhead. Just for clarification: Using a new thread for IO-bound methods makes only sense, if no non-blocking way of calling the method exists. In this case we use async over asnyc, which will be explained later. The most elegant and modern pattern is certainly TAP. There are big advantages of encapsulating a thread in a task. First of all we can connect various tasks and draw dependencies. Therefore we can create a whole tree of tasks, which results in a very elegant and expressive way of declaring a non-sequential program flow. Another feature is the improved exception handling and the optimized startup time. Tasks are managed by the TPL, i.e. from the programmer's perspective we do not care about the resources (threads) any more, but only on the subject which is the method to be invoked as an (independent) task. The problem with tasks is, however, that they still require some lines of code. We still want the following to happen: Execute the first part of some method, invoke some other (probably memory-bound) part of the same method in a different thread and (once that task is completed) execute the last part of the method in the same thread as the first part. All those steps should still happen with exception handling and of course with our GUI still responsive. So here we have our 3 regions. We can easily see that those 3 regions can be expanded to N regions. The only point we care about is the alternation of code that must be invoked from the GUI thread and code that should run in a non-GUI thread in order to keep the GUI responsive. Let's express this 3 region model in a simple yet illustrative picture. Two points are important here. The first point is that we actually create a new running task that has to be continued with some other task. That continuation is very important, otherwise we either have two concurrently running tasks (by just creating another task) or some code that runs before the work is actually started (without wrapping the code in another Task at all - remember that there is some startup time for any thread). The other point is that we need to use the TaskScheduler.FromCurrentSynchronizationContext() method to get a TaskScheduler instance, which uses the current GUI thread. If we do not use this, then we will face a cross-threading exception, since we will access GUI elements from a non-GUI thread. This looks nearly identical to the sequential version. We only changed two lines - the method definition has an additional async keyword and the SimulateWork() method is now called with an encapsulated Task. Additionally the spawned Task is also awaited using the await keyword. It should be noted that the async keyword does not spawn a new thread, nor does it do anything asynchronous out-of-the-box. The keyword just wraps the contents of the method into Task. This also enables the await keyword. That way the task had some meaningful goal - computing a double number. Giving tasks results is not always possible and does not always make sense, however, if possible the technique should definitely be applied. The other way is also possible. If one has a real async process (like network or file system operations) then exposing the usage as a sync method does not make much sense. Instead one should always expose method calls in an async way - just to keep going with the flow. If some user now wants to call the async method sequentially, then this is easily possible by using some features of the Task class. Here we are using the GetResponseAsync() method of the WebRequest class. It would make no sense to hide this async behavior of the lower level. Now the user has basically two options. The usual and preferred option is to use the async way. Now we can also use this in a sync way, naming the call sync over async. So using Wait() we can block one thread to wait for completion of some task. Alternatively we can use the Result property, which implicitely uses Wait() until the result of the task is set. There is also a method called RunSynchronously(), however, this one cannot be performed in this case, since RunSynchronously() may not be called on a task which is not bound to a delegate, such as the task returned from an asynchronous method. The most obvious usage of using await is to keep the GUI responsive. However, we will see that there is a lot more possible. In the patterns section we will discover ways of improving our code by keeping local states local. Keeping the GUI responsive is a good argument for using await, but what about async? Obviously async is required for using await. But there is much more behind it. Marking functions as async in some API should only be done with real asynchronous functions, otherwise (if it is in fact just a async over sync function) the API has been designed wrong. Keep in mind that every programmer could use async over sync, hence providing additional functions which just use async over sync is definitely wrong. So what is the lesson here? Do not lie about your APIs. If you are doing some sync stuff, then expose it as such. If you are doing some really async stuff, then expose it with async (and following the convention: the method name should end with Async). If you want to expose a sync version of an async function, then do not just use sync over async, but in a real sequential way of writing the function. The benefit is quite clear: If the creator of an API did not lie, the user will always know what's going on behind the curtain. If it is some new task that will be spawned, or not, and if it should be awaited or not. Always think about those 70 ms, which is approx. the max. time that any method call should take. If its longer, then your UI will most probably not feel very responsiveness. Therefore APIs should be designed in a way to let the user know which version to take. A big issue is the synchronization context, i.e. the thread which performs the work. Most of the time we will not specify a particular context, however, in case of GUI applications we want all actions that change the state of controls to happen in the default synchronization context. This way we keep the main benefit from await, which is using an asynchronous method without getting headaches in terms of exception handling, continuation and more, while not using the UI thread for the continuation. This is actually a best practice for writing APIs, since we do not want to unnecessarily block the UI. Being lazy and let the programmer who actually uses the API find out that all events inside the API must be re-routed to the GUI synchronization context. Being nice and already fire the events from the same synchronization context as the GUI. It is worth noting that SynchronizationContext.Default will automatically be set by instantiating a new Form in case of Windows Forms or by the Application class in WPF. Is is also important to remember that this default context is thread-bound, i.e. if our API class is already instaniated in some thread, there is no way to get the default synchronization object for the GUI thread. So this way only works if the objects have been instantiated from the GUI thread, but (some) methods of the object have been called from a different thread. This also brings up the problem that the API has to be thread-safe. If some methods are not thread-safe, then either the API design is wrong, or accessing them from various threads should be restricted. In either way we probably made some programming or design mistakes, which should be handled. Most problems occur from static function calls that rely (read and probably write) on static members. The SynchronizationContext offers two methods: Send() and Post(). Since we are using it with event handlers, we should always prefer the Post() method. It is asynchronous and does not catch on exceptions. This "fire-and-forget" method is exactly what we want in our case. Otherwise it might make sense to use Send(). Here we can catch exceptions from the method invocation and we would be able to run commands sequentially. It is important to understand that the SynchronizationContext class does not perform all the magic. Instead it is a specific implementation that is really useful. Sometimes it could make sense to use our own implementation of the class with the Send() and Post() methods, or to just use our own definition in case of SynchronizationContext.Default being null. More information on the SynchronizationContext can be found in this article by Leslie Sanford. The biggest mistake that people make when using the new keywords is to use async void. There is only one reason to use async void and that is the case if somebody wants to enable await in the code of an event handler. Since handlers have a fixed signature, we cannot change the return type of void here. Usually this is no problem, since the only methods that should call such methods are wired up internally and would not benefit from awaiting the handler call. Since we are not returning a Task, we will not be able to catch exceptions! We are not awaiting the web request... What if the request takes longer than those 2 seconds? So now this is pretty obvious. The code is actually calling the OnNavigatedTo() method of the base class, which is then calling the current LoadState() implementation. Nothing is awaited of course, so our code is continuing with awaiting the PlayIntroSoundAsync(). Now this is a kind of race condition. If the PlayIntroSoundAsync() method finished before the LoadState() method, we will see that the width and height of the image are still 0. Otherwise the code will work. So we are still starting the task in the LoadState() method, but we are not relying on that task being finished in the OnNavigatedTo() method. Instead we are awaiting the end of that task (in case of that task being ended already, there is no wait time). So again, using a Task as return type did solve this problem quite elegantly. That being said it is obvious that async void is a "fire-and-forget" mechanism. The caller is unable to know when an async void has finished and is unable to catch exceptions thrown from it. Instead exceptions get posted to the UI message-loop. Therefore we should use async void methods only for top-level event handlers (and their like) and return async Task everywhere else. Everything seems alright does not it? Usually an async lambda expression returns a task, however, lambda expressions are also restricted to their proposed (or required) signature(s). In this case the signature is given by the DispatchedHandler delegate. This delegate, however, returns void. So we will not catch the exception and we will also have a kind of race condition, since the finally block is entered at the same time as the m_Result variable is set. Therefore: Watch out for lambdas, i.e. verify the signature of the lambda and be sure that it returns a Task. What's wrong here? Well, obviously the return type of the async method is fine, since we are returning a Task<string>. In the ReadUrlIntoTextBox() method we are using this method sequentially, by calling the Wait() method of the task. Here is where the problem lies (and calling the Result property would result in the same disaster). What are we doing exactly? First we just setting some UI components. Then we are calling the ReadUrlAsync() method. We create a WebRequest instance and start a new task. By using the await we are placing a callback (continuation) in the GUI thread. Now we are waiting until the task completes, by blocking the GUI thread. This is it, since the GUI thread is now blocked and no continuation will be able to run there. This way the continuation does not require the GUI thread. Therefore the continuation is not blocked by the Wait() method and everything works as expected. The question here is - why is this the default way? Well, obviously for the standard programmer (mostly consuming APIs) it is much more convinient to always come back to the GUI thread. Hence such programmers have a lot less work. On the other side API developers are considered more sensitive about such problems, which is why the default has been in favor of API-consumer programmers. 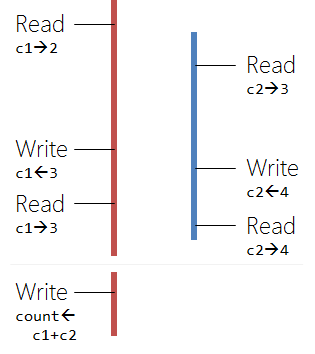 The last common mistake lies again in the difference of memory-bound and CPU-bound tasks. If we have some legacy code that should run in a different thread, or some CPU-bound task, then we should use Task.Run(). It will create a background-thread, i.e. it wil use one of the threadpool threads. This is alright. But if we just want to start some memory-bound operation, until it is done, then the right thing to do is to use TaskCompletionSource<T>. The code looks really nice, but it has one major drawback. In the real code several thousand pictures have been loaded. Now this resulted in several thousand await statements (and as many threads). This caused a lot of overhead and the UI was not responsive for more than a second. Not very nice! The solution is quite simple - don't try to perform huge quantities of await at the same time; process them sequentially. For years we've been waiting for this: Having multi-threaded code that looks like sequential code. This all is possible by using async in combination with await. It is probably the right place to say, that this is not parallel code which looks like sequential or serial code. There is a huge difference. 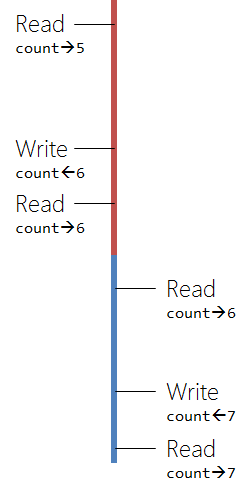 Parallel code is realized by using the TPL (or self-spawning all the workers, most efficiently over an optimized thread-pool) and requires a different kind of synchronization. We've seen a very simple (and useless) parallel code in the beginning with the increment of the count variable. The question now is: What else can we do with this new elegance of writing multi-threaded code? In the next subsections I try to come up with some design patterns, which could reduce complexity, strengthen maintenance and provide an elegant solution to some problems. This pattern has been introduced by Lucian Wischik. For more details about him consider the points of interest section. Sometimes state machines (even for really simple systems) tend to blow up. They are expanding, and become more and more complicated. Suddenly the whole code looks like madness, with no one knowing what's the purpose of the most methods there. The problem here is usually over-generalization. The solution has been quite hard, since keeping parts of the code more local required even more classes, restrictions and more. The main problem, however, was that for keeping something more local, one had to use different threads (since the UI thread is blocked otherwise). Before we would have had 2 methods and one handler for the button. The first method would have been the initial state, the second method the final state and the event handler would have been required to go from the initial to the final state, once the initial state has been entered. If that does not sound complicated to you then I don't know - for me it sounds too complicated, especially since (usually) we will have several states and those 2 states (initial, final) would be just 2 states of out n states (n is usually bigger than 10 in such scenarios). Now we could just introduce it to one method. This one method is one of the top level states. Hence we have a nice grouping. So here we are starting the playback of sound. Usually we would require some event to recognize the end of the playback. Now we are just doing it using the await mechanism. While the sound starts playing we are busy spawning more tasks, which will perform some animation (shaking the free hanging apples). Now that all our media is wrapped as tasks and busy running, we will wait for the sound task to stop. Once this is done we will just cancel the animation (enough shaking). Keeping all those actions in sync would have been quite a headache, but async and Task made it quite easy. Those extension methods do nothing other than telling the compiler that we actually use the instance for something. For us more important is that they tell the user, that the "fire-and-forget" mechanism has been used intentionally. We do not care about the button click, which is why we just have a "fire-and-forget" method here. The important part is in the code. We could make the game a lot more complicated and still preserve a kind of overview, just by localizing states in methods. Here variables that are only used when the balls are moving are placed in the method. The MoveEllipses() method call returns a task. That task will continuously move the ellipses, until the cancellation token is used. We see that all ellipses are actually moved, even though only active ones are visible. So this implementation could be improved in that area. On the other side we use the Dispatcher to move the ellipses in the GUI thread. Every 10 ms such a move is actually performed. We all know and love MVVM, or at least the binding capabilities of WPF. A possible drawback is that binding usually has to happen sequentially, i.e. there is no direct way of telling the binding engine to perform the binding in a different thread, with the interaction to the control being handled in the GUI thread. However, we might want to bind our data sources or some fields to some web requests or other sources, which might take a while to transmit the required data to our client. In any case we do not want to lose responsiveness in our application, due to the binding engine. 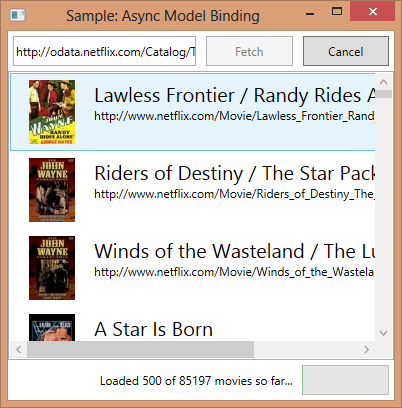 There are many stages to async model binding. This section will NOT be about how to create async properties - this is not possible. It would be nice to bind such values, but do not think about it as a restriction, but more as a motivation and guideline. It should motivate us to use caching and to request changes over methods. Such (asynchronous) methods should then change the value of the properties. There are other advantages of this pattern (like the ability to return null in case of failure or the ability to return a more specialized version if certain criteria are met), but this section will be more about the model binding issues. The asynchronous factory and similar helpers are presented for completeness only. The interesting fact about MVVM in WPF is that in WPF, if a background thread modifies a databound property, the binder itself will marshal that change back to the UI. Even more interesting: New in .NET 4.5 is the ability to use the BindingOperations.EnableCollectionSynchronization() method for update (add, change, delete) values in databound collections like ObservableCollection<T>. This way we can easily add values to the collection from another thread. So having no problems with collections is one problem less. However, most of the times we will spawn new threads or wait for some request in case of user-input, i.e. of some button is pressed or more generally if a command is invoked. The problem is, that ICommand implements everything in a "fire-and-forget" paradigm (returning void). The key is therefore to avoid reyling on the code spawned by the command and use the command only to trigger an asynchronous code in the view model. The view model is then controlling the execution state by changing some property. This property is then used by the command to determine if the command is executed at the moment. If it is executed, then we should skip execution (i.e. the buttons associated to that command should be disabled), otherwise we would allow it (i.e. the corresponding buttons would be enabled). The given example in the source code is a modified version of Lucian Wischiks sample code for obtaining the list of movies from Netflix. The picture above is a screenshot of the sample application. I will hopefully find the time to include this soon. Some of the work presented here is based on a talk of Lucian Wischik, who works on the C# language design team and was heavily involved in introducing the new kewords. He also inspired me for the asynchronous patterns section. His blog is available at blogs.msdn.com/b/lucian/. 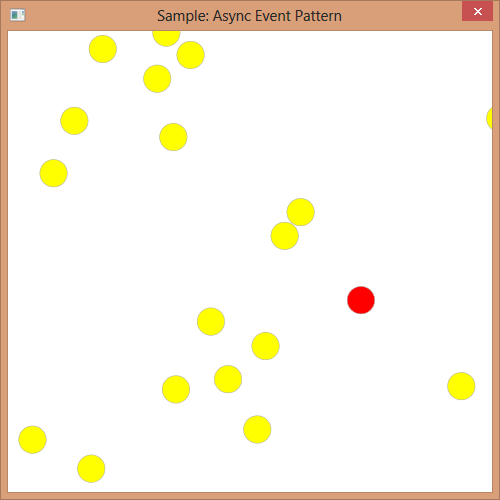 The WinRT API includes a lot of async marked methods. Some of them do not offer sequential versions. 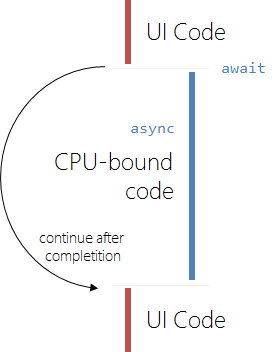 It is therefore important to understand, that async / await are two very important keywords, which make it impossible for any programmer to blame the programming language for not implementing multi-threaded code. More than a decade ago, multi-threaded code should already have been mandatory for any programmer (slow disk access, even slower network times, ...), but nowadays with super-responsive apps and more network access than ever, this seems like the only right thing to do. The minimum requirement for async / await has been set to .NET-Framework 4.5 with C# 5. However, it is possible to install C# 5 on development computers, which do not have access to Visual Studio 2012. The async CTP gave every computer with Visual Studio 2010 a preview version of C# 5, which is nearly identical to the release version. Finally also the framework requirement (and that is much bigger problem, since this is not only required for compilation, but also for running the application) has been lowered from .NET-Framework 4.5 to .NET-Framework 4. It is possible to access the async / await feature in .NET 4 by using the AsyncTargetingPack (see NuGet, Microsoft.CompilerServices.AsyncTargetingPack). The requirement is, however, that Visual Studio 2010 (VS11) is installed. Working with asynchronous methods has gained a lot of interest and momentum since async / await have been introduced. A lot of good APIs, applications and helpers have been written with the new keywords. Most of the problems that have been seen can be cured by not using async void and by drawing a picture of the program flow. Realizing that (even though with the await keyword the code looks sequential) the program flow is not sequential anymore will help in detecting most problems. The ability to reduce complexity by keeping local states local. The power to have an ultra-responsive UI. Therefore it does not only make a lot of sense to use the new abilities for creating new patterns, improving UI performance and having more options (like stopping running tasks), but also to design APIs with asynchronous operations in mind. Created 3/16/2013 9:22:25 PM .